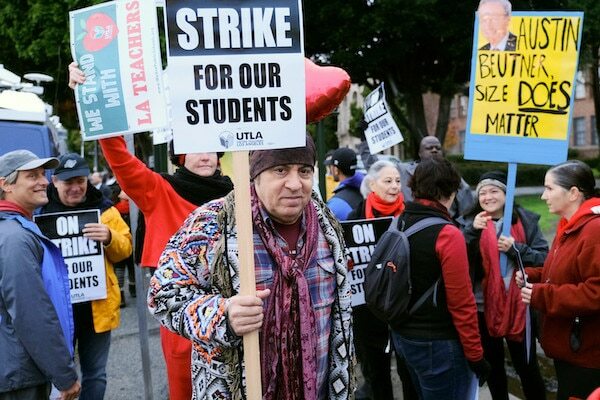 Corporate media absolutely won’t tell you this, but this year’s Los Angeles teachers strike is the latest chapter in the long running struggle against the privatization of public education in the U.S. With massive public support, 30,000 teachers have voted a settlement that increases their wages a little, brings back nurses, librarians and counselors to each and every one of the city’s 900 schools, caps class sizes and charter school expansion and more. Striking teachers managed to bring issues to the table that were supposed to be impossible to address, like the manipulation of school board real estate, school closings and charter policies to gentrify neighborhoods, among others. If you want to comment on our articles visit Black Agenda Report’s Facebook page and join the discussion there, or send us an email to comments@blackagendareport.com. I’m Bruce Dixon, managing editor at Black Agenda Report. You can email me at bruce.dixon(at)blackagendareport.com. Thanks for listening.